Mark Twain once delivered a comical speech on the weather in New England in which he said, “There is only one thing certain about New England weather: you are certain there is going to be plenty of it.” New England weather is notoriously unpredictable. Consequently, it presents a special challenge for cyclists who camp in the region. We combed through buyer reviews, gear blogs, and recommendations from experienced cyclists to pull together the consensus choices of the best tents for bikers touring the Northeast. The criteria for the tents we chose was comfort in both fair and foul weather, ease of setup in windy or rainy conditions, excellent weatherproofing, and durability. We preferred lighter tents, but we didn’t exclude heavier ones since a tent is arguably a bikepacker’s most important piece of gear. Before we dive in, we want to clarify one distinction that will help you decide which tent is the best for you. The first three tents we chose are freestanding tents, and the last three are tunnel tents. Freestanding tents can be set up without stakes, can be moved easily, and typically have more headroom. Tunnel tents have a larger footprint with less headroom and require stakes for pitching, but they typically have larger vestibules for gear storage. And while you’re doing your trip planning, check out our recommended bike racks, car camping gear and water bottles. The 2-person freestanding MSR Hubba Hubba NX (purchase at REI) is our top choice for a cyclist touring New England, whether for a weekend or for a month. It’s one of the most popular 3-season backpacking tents right now, and it easily meets all our criteria for bikepacking: excellent weatherproofing (for both wind and water), great ventilation, easy to pitch (with great alternative configurations for pitching in foul weather), rather light (packed weight: 3lb 13oz), very roomy, and very durable by all accounts (Amazon reviews, REI reviews, personal testimony from long-distance cyclists). It’s also compact when packed (6 x 18 inches). The Hubba Hubba NX is a great choice for an extended solo tour because you’ll have plenty of room for your gear and for maneuvering inside if you get stuck in a storm. 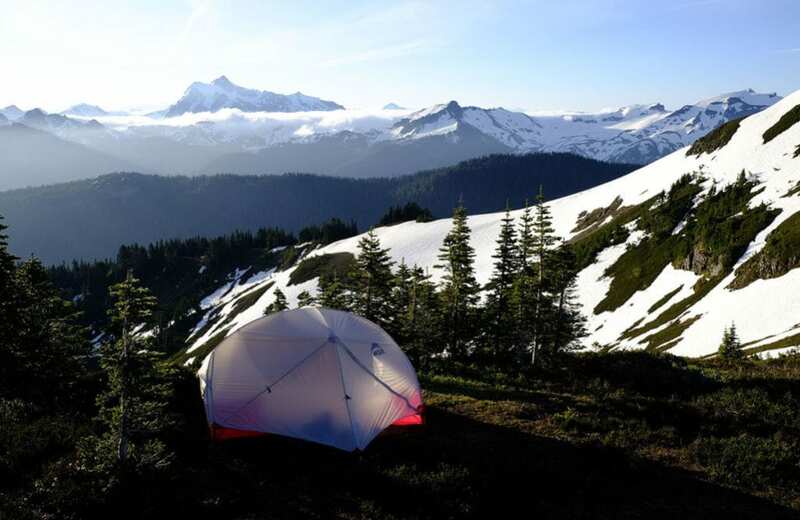 The 2-person freestanding MSR Elixir 2 is another 3-season tent that is similar to the Hubba Hubba NX in its footprint, volume, and weatherproofing but is made of heavier, more durable materials. It also has a bit more headroom. The heavier materials make for a much lower price, so if weight is not of primary importance for you, we would recommend considering the Elixir 2 over the Hubba Hubba NX. The freestanding Big Copper Spur HV UL2 is a versatile option for bicycle touring. 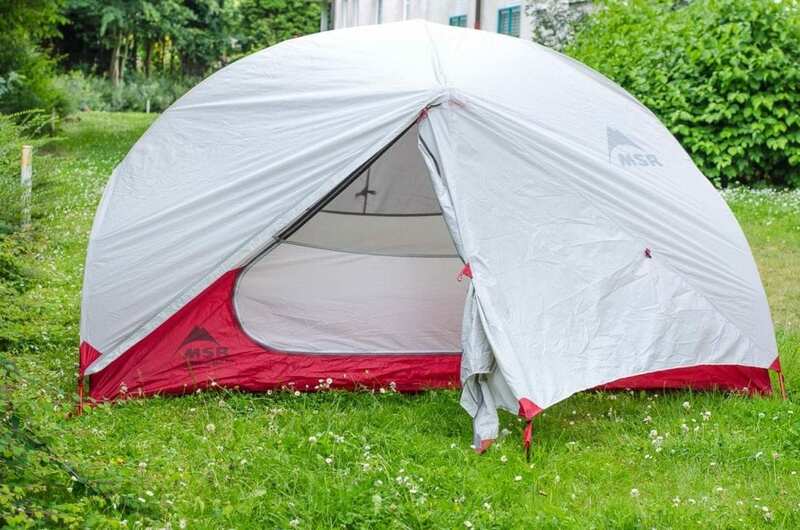 First, be aware that there are several different sizes and colors for this tent (from 1 to 4 persons). We have a lightweight Big Agnes tent and as advertised, we’ve found these tents to be comfortable, highly wind resistant, mostly waterproof and amazingly lightweight (coming in under 3 pounds). While we still prefer the MSR Hubba Bubba for bike touring, the Big Agnes Copper Spur HV UL2 can be used for both bike touring and minimalist backpacking without giving up any functionality. Keep in mind that the “HV” designation refers to “high volume.” This catchy marketing term describes the near-vertical sidewalls and relatively open design of the tent that increase the interior usable volume of the tent by 20% compared to earlier versions of the tent. The Vango Banshee 200 is a 3-season tunnel tent billed for two people. However, some users report that it’s a little cramped for two, and one world-touring cyclist writes that if you’re taller than 5′ 9″ you might be touching one end of the tent with your head when you lie down. It’s fairly light (about 5 pounds), very waterproof, and performs very well in high winds. You can pitch the inner tent and outer tent together, which is very useful for keeping the inside dry if you’re setting up camp during a storm. Being a tunnel tent, it does require solid terrain for the guying pegs. Perhaps the greatest advantage the Banshee has is its price: it’s by far the cheapest tent in our lineup, and definitely the best value. If you’re touring alone and cost is an important factor in your decision, this is your best option. 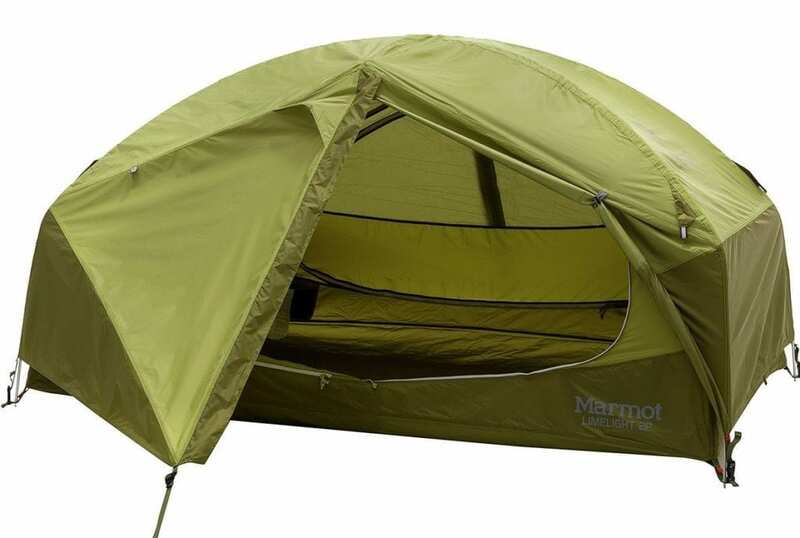 The Marmot Limelight tent is another versatile lightweight, freestanding tent that can double as a bicycling touring tent and a backpacking tent. This is a 3-season, 2-person tent that comes in around 5.2 pounds. It does come with a footprint and you’ll need a little more room to fit this one into your panniers. This version of the Limelight has two vestibules and comes with color coded clips and poles to make set up as painless as possible. 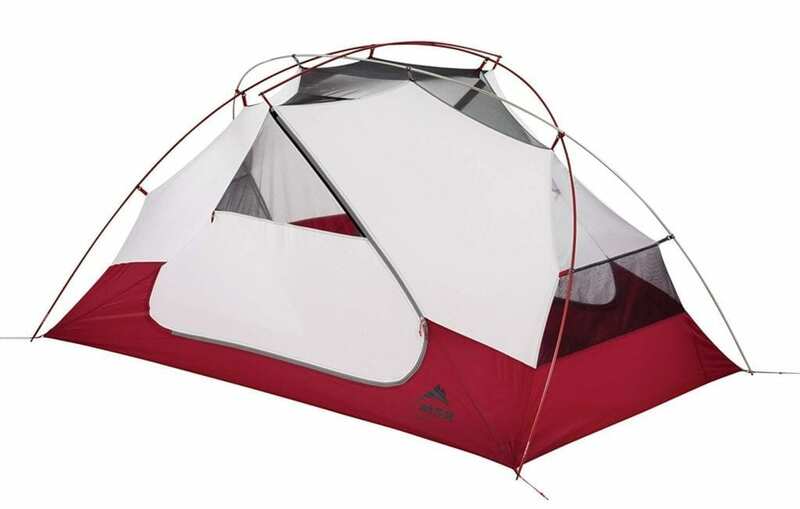 Marmot also added a large double door and 1 rear D-shaped door to make getting gear in and out of the tent simple and convenient. The Big Agnes Tiger Wall Platinum 2 is an amazingly well-rounded option for bike touring. This beauty weighs 2.4 pounds and comes with 2 doors and a vestibule. 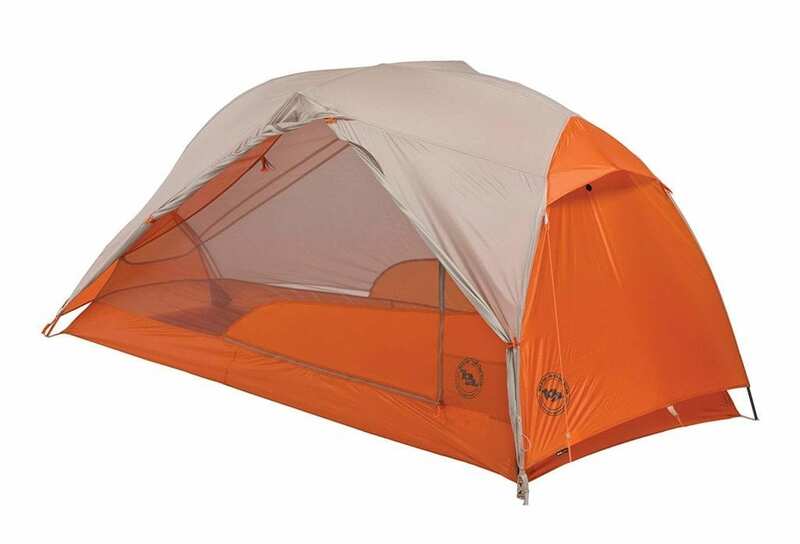 Although the Big Agnes Tiger Wall is semi-freestanding since you’re required to stake out the foot end of the tent to secure it, it’s rated as a 3-season tent and has a 15-denier floor and rainfly, which is extremely thin. 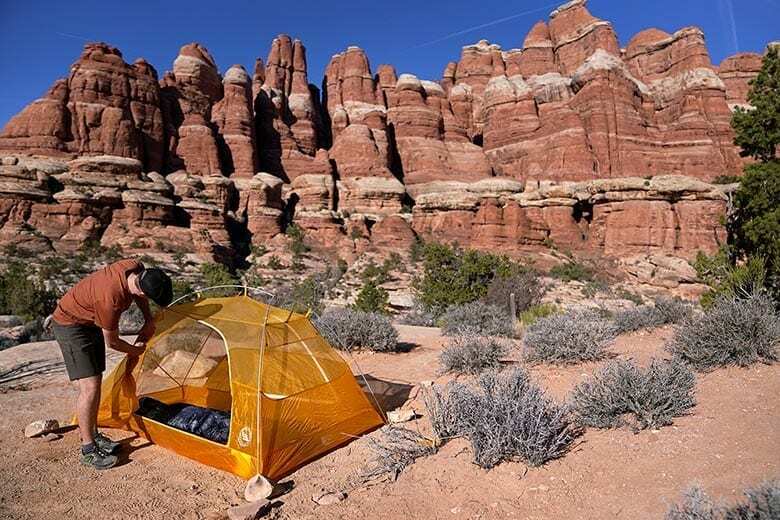 Big Agnes improved the tear resistance of this tent by adding a silicone treatment to the solid fabric, but keep in mind that since the tent materials thin, they are see-through. We highly recommend this tent for bike touring, backpacking and just about any other sport that requires quick setup, protection from the elements and lightweight versatility. The MSR Hubba Hubba NX is the best all-around choice for its excellence in ease of setup, weatherproofing, durability, and comfort, all at a mid-range price. The MSR Elixir 2 is a bit heavier, but it’s more durable and has a bit more headroom at a cheaper pricepoint. The Vango Banshee 200 is far and away the value option while still providing good durability–it’s just a bit small for some. The Marmot Limelight is a solid option if you’re looking to save some money and don’t mind adding an extra pound or two. Lastly, any product from the Hilleberg Nallo series is the right choice for the touring cyclist (or couple) who wants the ultimate in quality and durability. Although the production quality is lacking, we thought you might be interested in this comparison between the Big Agnes Tiger Wall and Copper Spur. How Do I Choose the Best Road Bike for Me?